Oh My – The Bookshelf of Emily J. 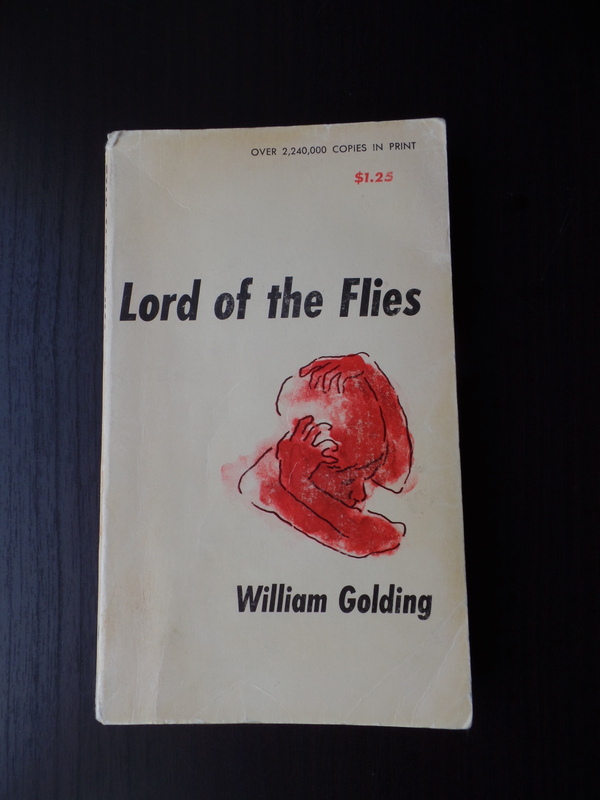 We finished reading Lord of the Flies (1954), number 49 on the BBC book list, by William Golding. I read it to my 11-year-old daughter, who has been recovering from a tonsillectomy and an adenoidectomy this week. I’ve read it before, but I had forgotten most of it. On the surface, Lord of the Flies is about a group of British boys who crash-land on an island from an airplane and they must figure out how to survive until help arrives. The first two boys we meet are Piggy (his unflattering and unwanted nickname) and Ralph, two twelve-year-olds. The two find a beautiful white conch and blow it to call the others to a central location. Once gathered, Ralph is named chief, and he makes plans to keep a fire as a signal going on the island’s uppermost point so that they can be rescued. These plans work well for a while. The boys eat fruit, swim in a lagoon, and gather under palm trees on the beach a few times a day to discuss duties and what can be done, especially for the “littluns” or the littlest boys that are with them. However, as Golding intended, this book is not about well-behaved English boys with manners and obedience to societal conventions. It is about human nature and what can and will happen when such nature takes over. I also saw fear as a motivating force for this novel’s trajectory. It seemed as if most of the trouble they faced was due to fear, not facts, and that fear led to some disastrous results. The fear begins with the littluns who have nightmares. Those nightmares become stories of a monster on the island, and the older boys disbelieve the accounts. However, one littlun has disappeared, and when Ralph and some others climb to the top of the island to investigate the fire going out and a possible monster sighting, they see something frightening. It turns out to have been a rotting corpse attached to a parachute, which moved the body with the rise and fall of the wind, but the boys did not see that. Fear descends on all of the boys, and they begin to fracture. A boy that had been jealous of Ralph’s position as chief asserts some authority. He is Jack, who has found a way to hunt the pigs on the island for meat. Jack and his group make hunting a priority over keeping the fire going. Consequently, when a ship is spotted in the distance, it is Jack’s fault that the fire is not signaling for help. Tensions build between Ralph and Jack, and eventually most of the older boys follow Jack to another part of the island to start their own tribe, complete with war paint and spears. The tribal behavior results in the murder of another boy named Simon, who enters the tribal dance after a pig feast at the wrong time. Simon has come to explain that the monster is just a parachute with a dead man attached, but nobody listens and they instead kill him, as the proxy monster. This is just the beginning of terror on the island. Ralph, Piggy, Sam, and Eric are left out of the tribe. They decide to approach them, in order to get back Piggy’s glasses, which were stolen. In that attempt, Piggy is killed in a fall and washed out to sea, Sam and Eric are taken prisoners, and Ralph runs away with some spear wounds. The denouement of the book occurs when the tribe decides to hunt Ralph. He hides, he runs, and he panics. The tribe sets the island on fire to smoke him out of his hiding places in the jungle and the brush. He runs for his life to the beach in a gripping final chapter. On the beach, he runs straight into a naval officer, who has landed because he has seen the smoke. Oh, the irony! The boys admit to “war games,” and even mention the deaths. However, they are sobered by the arrival of a person of authority. Jack is no longer trying to kill Ralph. The tribe is no longer a group of “savages,” but instead, a group of boys playing in the mud with sticks. I am pleased to have reread this book. I know it is a gruesome one, and an infamous one for many of us from our school years. However, I see why it is required reading. I understand why it is a classic. My daughter “loved” it, in the sense that she was gripped by the book’s deep meaning even while cringing at the horrible actions of its characters. I think she’s ready for the Exploration in Literature class I insisted she sign up for next year in seventh grade. It’s a elective, and she didn’t really want to take it, but I suspect she’ll enjoy it and we will have many wonderful evenings of reading great literature together and discussing its significance and applications. This was not a required read for me in school, but I did pick it up at age 11 or 12 and simply could NOT get into it. Haven’t tried since and feel it is one I could leave for others. Though I get the arc of the story… Glad you read it to her. Wish I had had a mother so inclined! And of course she’ll love the literature course, since you’ll be reading and discussing with her! I hope she’ll like it! If you have the inclination now, revisit it. It is such a gripping book. A great review! I loved this book but read it as a university student rather than as a child. You’ve made me wonder whether my own boys would like this – they’re 10 and 12. Perhaps better within the safety of a reading aloud book like you did with your daughter rather than left to read for themselves? Last year we read Coral Island which is the story of what happens when a small group of well behaved boys are left on a desert island. I have not heard of Coral Island, but it sounds like a spin off of this one? Maybe? Anyway, I would say they might like it, but definitely read it to them. There were some parts we stopped and discussed and I think that made it easier for her to handle. Stopping and discussing sounds like a good way to handle the difficult subjects in the book. Coral Island might have been a precursor to this one – R L Ballantyne wrote it in 1858! Interesting! It sounds more like Golding borrowed from Coral Island! This book doesn’t appeal to me, but your daughter is very lucky to have a mom who encourages literary discussion. 🙂 My mother fostered my love of reading when I was growing up. I hope she recovers from the surgery soon! Thank you! I think reading to kids is the best way we can spend time with them. Those are some of my favorite memories of childhood as well. Definitely. 🙂 My five-year-old nephew recently started reading, and it’s a joy to listen to him read aloud and to read to him. As an auntie to lots of nieces (but just one nephew! ), I usually buy books for Christmas and birthdays. My mom always read to me and my sisters, so I’m trying to pass it on. 🙂 I think all parents should! This book was the GCSE required reading book for my older brothers, and i found a copy of the book and read it myself when i was 11. I definitely need to read it again though. Yes, I would recommend reading it again. I had forgotten so much that it was like reading an exciting new book. I read this in school, but in high school What did your daughter think about it? She LOVED it. She was gripped by the story, and we had a nice chat afterwards about fear and human nature unchecked. I loved my mother reading to us (all 4 of us!) when we were young. She was really expressive and it was a great way to be together. My mother reading to us is one of my favorite memories as well, so I have made sure to pass that on to my kids. Confession: I’ve never read Lord of the Flies–but now I at least know what it’s about! Yikes. We discussed this in school book report and had to watch the film version with the rest of my class. I saw it again couple of times in the last years and I might say I can understand the concept better than before. It’s tragic. And still current. More than ever. I think I understood it more now as an adult than I did when I was younger, too. I think I read this in junior high and have been meaning to re-read it. My list gets longer and longer every day. So much to read! I read this in school and remember liking it, but it was so long ago that it was nice to have a refresher! You’ve made me want to read it again. I wonder if kids still read this in school. No sign of it for us, so far (up to and including grade 9). I’ll be interested in hearing about what books your daughter will be reading in her Exploration of Literature class! I’m looking forward to seeing what she’ll read in that class too. I think I’m more excited about it than she is! Haha. I’m pretty sure I would be, too! Lord of the Flies is amazing: a short read, but so much packed into it regarding Freudian psychology and references to history and religion. I recommended it to teens and preteens constantly when I was an English tutor, because it’s a classic alternative to The Hunger Games when it comes to the savage nature of people through the lense of children. Yes! You are exactly right. It is the original Hunger Games, and more sophisticated and subtle too. Emily, reading this fine post takes me back to school days when I too studied ‘Lord of the Flies’. It was gross, sad and unnerving. But, it seems Golding intended that kind of response to his novel. As you say yourself: “I see why it is required reading. I understand why it is a classic.” It is fascinating to see it introduced to a new generation. It will be interesting to see how your children’s generation respond to the works of Golding and also Orwell. It’s great to see so much interest in reading aloud to children/young people, and I’m so glad you are reading to your daughter, Emily. I read stories or poems to my children every night until my son was 13 and my daughter 11 (they are grown up and married now). I loved it! One of the best books we read this way was “To Kill a Mockingbird”: I think reading aloud actually makes the discussion of difficult and sensitive topics happen naturally, as questions are bound to arise. We had some great discussions. Oh, and I used to try and “do” the required accents, too, so there was an element of authenticity…! You won’t be surprised that I love audio books and radio plays adapted from books – that’s my way of becoming the wrapt listener. It sounds like your children have been blessed by your love for reading and your ability to do the accents! So fun. I will plan to read To Kill a Mockingbird to her soon. Maybe it will be part of her 7th grade curriculum. That is such a great book. That is a great book and kudos to you for exposing your kid to such literature! When I was 12 I read The Metamorphosis by Kafka all alone – so definitely I missed so many things – but I remember it clearly as being the first time I understood a metaphor. The monster was inside all of us; it’s there everyday. Wow! Look at you and your twelve-year-old self! Maybe Kafka is my next stop with my daughter and our literary adventures.